The most exhilarating golfing experience on the planet, the links at Royal County Down are located in the small town of Newcastle along the sands of Dundrum Bay and in the shadows of the mighty Mountains of Mourne as they famously sweep down to the sea. The club was formed in 1889 and its first eighteen-hole course designed by Old Tom Morris, who was presented with an ideal piece of golfing ground when he arrived in Newcastle to prepare his plans. The designer spent two days on site and charged the club just £4 for a course which was open for play within the month, proof of how suitable the virgin land here was for golf. Old Tom’s routing had the course set out in a single tangled loop with holes regularly trampling east and west across the site’s duneland. This layout changed dramatically over the next two decades, however, and mostly at the hands of George Coombe, the clubs autocratic ‘Convenor of the Greens’ and one of Ireland’s first plus markers. Inspired by the potential of its incredible setting, Coombe continually altered the holes and by 1907 had replaced each of the Morris holes and rearranged the course into two north-south loops returning to the clubhouse. In 1926 Harry Colt was employed to help the club overcome its perceived weaknesses of having too many gathering greens and semi-blind approach shots. Colt’s plan included a new 4th hole, several additional bunkers and the merging of two blind holes into the 9th, arguably the greatest par four in the game. 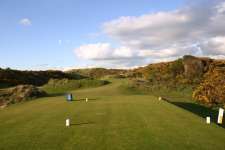 He also adjusted several green sites and introduced the now infamous gorse to the site’s tumbling dunes. Though the club continued to make minor adjustments, the layout Coombe started and Colt finished is basically what remains today. 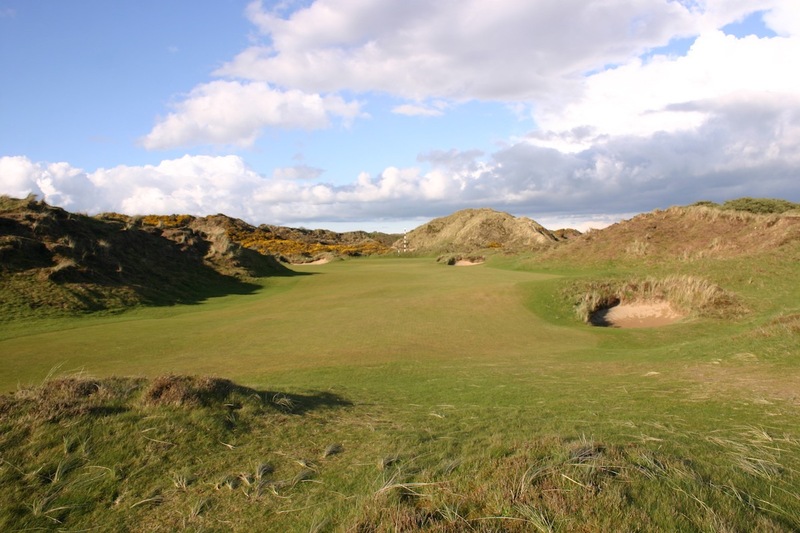 What makes Royal County Down so impressive is the combination of thrilling design and the inspired use of its magnificent dune structures, which are probably the most attractive in golf and certainly the most conducive to exciting play. 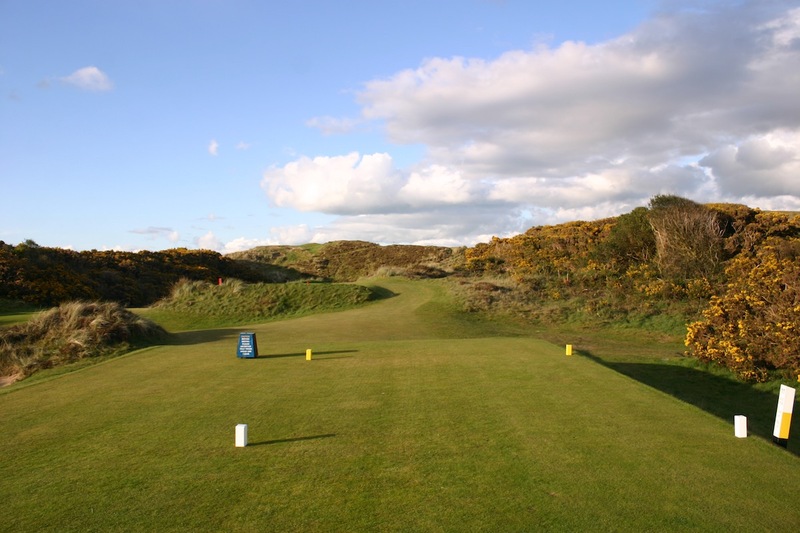 Lined by purple heather, golden gorse and fearsome bunkers fringed with coarse sea grasses, the fairways are often routed right across the rugged hills with numerous drives played blind over the dunes with only a small white rock atop their peaks to indicate your ideal driving line. Such moments brilliantly test both your mental and physical abilities in equal measure as you must be able to stand on the tee with an element of uncertainty, and still strike a meaningful and accurate blow down the fairway. The intimidation of driving blind on holes lined by such formidable rough areas can be overwhelming yet the landing areas are not as narrow as they appear and the hazards are actually set reasonably back from the preferred playing corridor. Stray here and you usually get caught but County Down can be more forgiving than it first appears and, if in control of your golf swing, is a links that, despite its reputation, can be tamed. The front nine features the most exceptional stretch of golf holes on earth, starting with a great par five played along a jumbled ridge that separates the links from the sea and then moving onto consecutive world-class par fours, the 2nd a daunting driving challenge across a steep ridge and the 3rd played through fescues and traps and into a magnificent green set beneath a glorious dune. Colt’s long one-shot 4th and the semi-blind par fours at 5 and 6 are also great holes, the approach into the small upturned saucer green at the 6th is particularly tricky and shows off the links subtle side. As does the gorgeous 7th, which turns back towards the mountains and may be the world’s most underrated short par three. 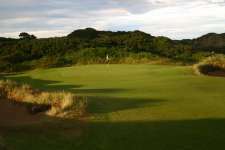 The genius of the hole is its putting surface, which appears tiny from the tee as the left side falls away behind a deep frontal bunker and the higher right side is hidden by a small knoll. The 8th is then a terrific two-shotter that rises gently toward a difficult crowned green. 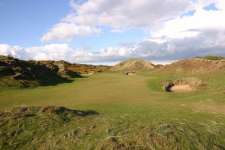 Best of all, though, is the awesome 9th hole, with its blind drive plunging across the side of a hill and its wonderful green resting beyond cross-bunkers and in a saddle between two dunes. The view out over the sea and across the town of Newcastle to the Mountains from atop this fairway is remarkable, and as golfers we are blessed that such a beautiful setting is available for our recreation. Despite some problems toward the close, the back nine is also outstanding and the stretch from the 10th to 15th is as strong as anything else in Ireland outside the opening holes here. Both the 10th and 14th are excellent par threes that demand shots with different shapes while the 11th is a nasty four with a daring drive across the steepest hill on the course. The reachable par five 12th is another beautiful hole and followed by a brilliant par four through thick roughs, the approach crossing a gorse covered sand ridge into a partially obscured green with just the yawning left side traps visible and catching those unable to throw the ball into the more open, but hidden, right side. The finishing trio, however, is strangely anti-climactic. The 17th is a very odd hole while the bunkering on Donald Steele’s new 16th is a little out of context with the rest of the layout. The 18th has also been reworked by Steele but, despite being an improvement, it cannot mask the fact that this course really is a tale of two sides, one excellent and the other extraordinary. 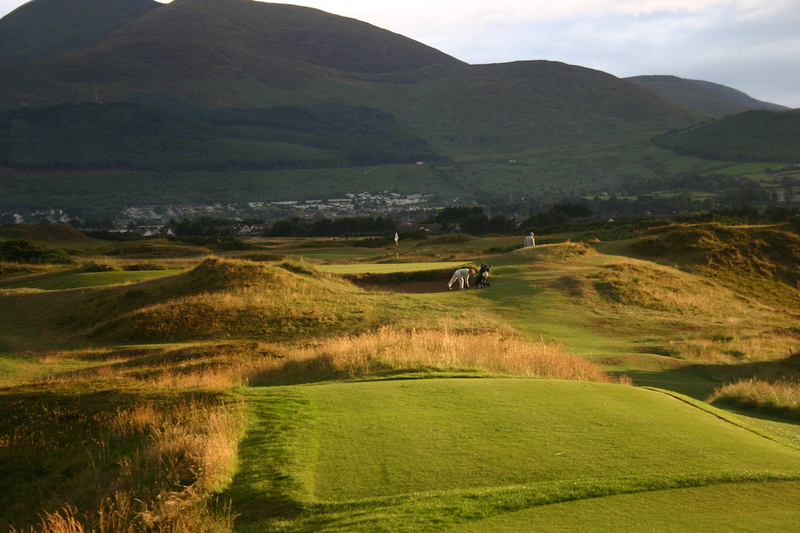 There is no finer links than Royal County Down and despite one’s best efforts, it would be nigh on impossible to accurately describe the pleasure of playing here, suffice to say that once experienced it will duly leave you with an enhanced sense of golfing perfection. 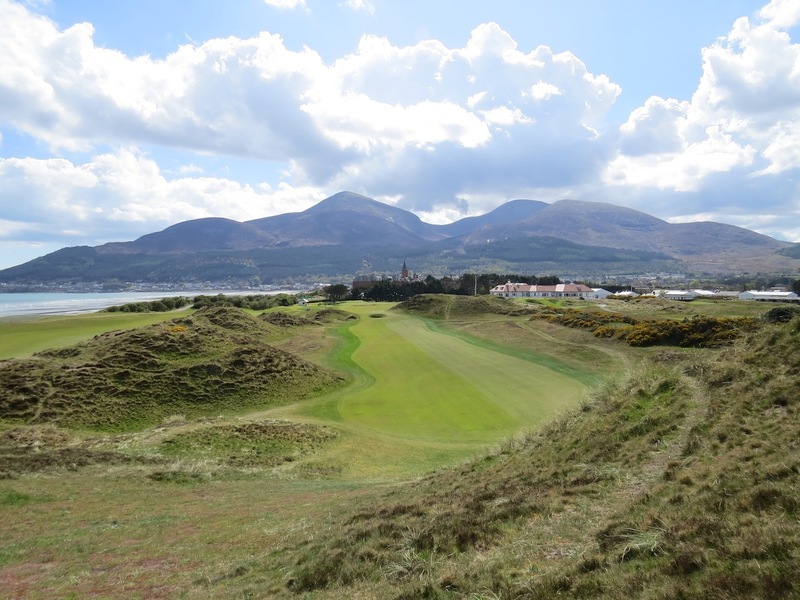 If you had just one round of golf left to play, it would be hard to mount an argument against that being at County Down.